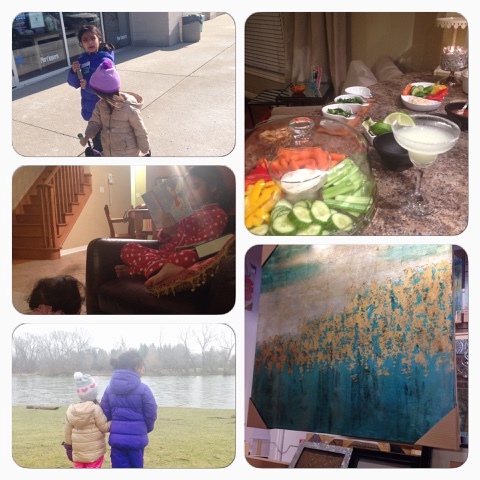 it's my girls' world: February Weekending…. Weekends just seem to fly by! Weekdays on the other hand….. I totally neglected to take many pictures this weekend… Too busy being busy I guess. + (I) ran lots of errands with the kids on Saturday… including going into the very glass filled Pier 1 with two curious girls. There we scored some little paper trinkets on clearance for eight cents each. I don't believe I've ever paid eight cents for anything in my entire life!! + finally got caught up on laundry! + went to an awesome Superbowl party with Jenn and Alex complete with devilled eggs, nachos and margaritas! And beer too of course… but who gets excited about beer? I thought that the half time show was one of the better ones recently and I'm glad that Peyton Manning is getting to go out on that high! Happy Monday, friends! And to my trinis, have a wonderful Carnival! How awesome having a Chapters by you! That's my happy place. Also, anywhere that there's beer is my happy place. Deer poop totally looks like black beans! I will never be able to look at them the same again lol. Defintiely having Carnival tabanca today! Thai food from a gas station is interesting but hey if it's good, I'm always down for some Thai. In fact a met up with a girl friend for lunch today at a local Thai place. I don't think I've ever only paid $0.08 for something!! Amazing find. I have been meaning to go to Chapters too! And maybe grab a little Starbucks while I'm there! Glad you have a great weekend! The weekends always go by WAY to fast. Sounds like you had another great one!